What do you get when you combine the crisp taste of Virginia apples with the cider-making prowess of a New Zealand master? Kid in a candy shop grin! Bold Rock Hard Cider, that's what. On an impromptu drive through Nelson County earlier this month, I stumbled across the mecca of my hard cider taste buds. 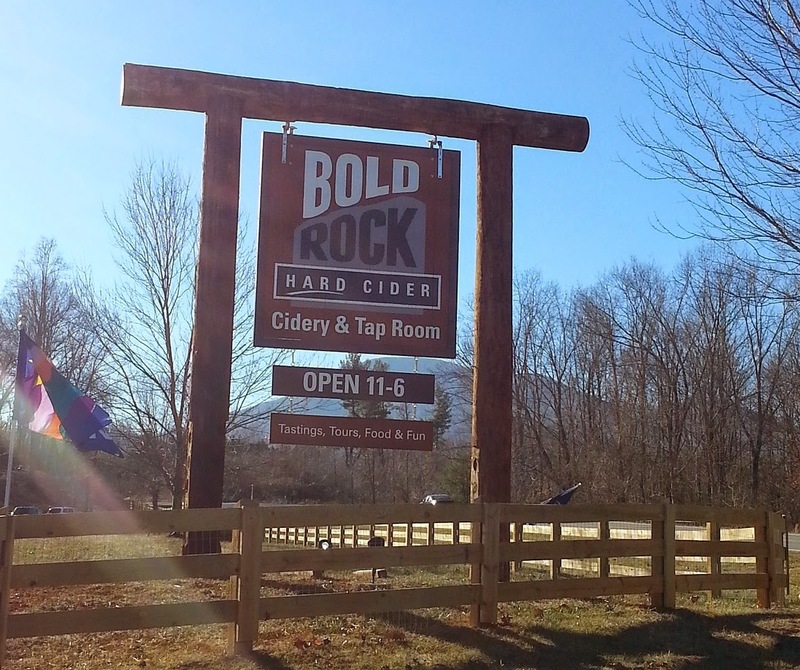 Situated on fifty beautiful acres in the heart of the Rockfish River Valley, Bold Rock cidery was established in 2012 with a lofty goal: to reestablish hard cider as the #1 alcoholic beverage in the United States. To accomplish this goal, owner John Washburn reached out to the master of the industry, Brian Shanks, a New Zealand cider innovator who has contributed to the success of such cideries as Woodchuck and Strongbow, and from this partnership, Bold Rock was born. Although I've been purchasing Bold Rock's Virginia Apple cider in the grocery store for several years, I had not made the pilgrimage to their tasting room previously, nor had I planned to do so that day. Serendipitous good fortune guided my route on a drive to the Blue Ridge Parkway and resulted in this delicious detour. Imagine a kid in a candy shop, only old enough to enjoy adult beverages. That was my reaction. 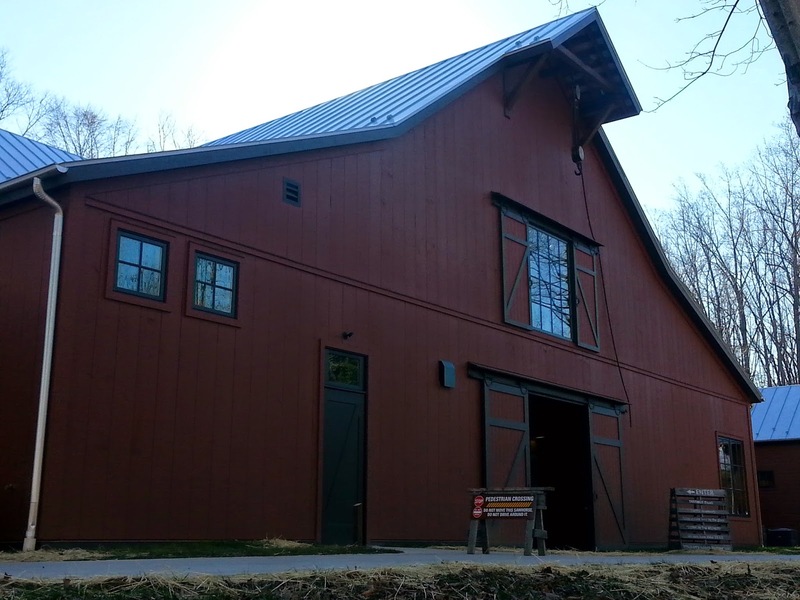 Bold Rock recently debuted a $4 million, beautifully-appointed "tasting barn" to feature their seven ciders. On our visit, two were offered for free tasting -- the Virginia Apple and the Vat No. 1. -- and flights of four ciders were available for $5. The Virginia Apple is everything a hard cider should be: full of crisp flavor with a smooth finish. The Vat No. 1 is a premium cider and tasted almost more like a champagne than a cider, but the apple taste was unmistakable. All the apples used in Bold Rock's ciders are harvested from local orchards for their Virginia ciders, and the water is also sourced locally. They've recently expanded their ciders into the North Carolina market with the debut of a Carolina Apple and a Carolina Draft. Even in winter, the views of the farm and the Rockfish river from the tasting barn were breathtaking, especially when surveyed over the rim of a mulled cider. That's right, Bold Rock also throws together a hot cider concoction on certain days, and with a glass of that in hand, you'll be feeling warm and fuzzy in no time! With a line-up of award-winning ciders for your taste buds and a beautiful barn and farm for your eyes, Bold Rock should be the next destination for your road trip. Or a great detour. 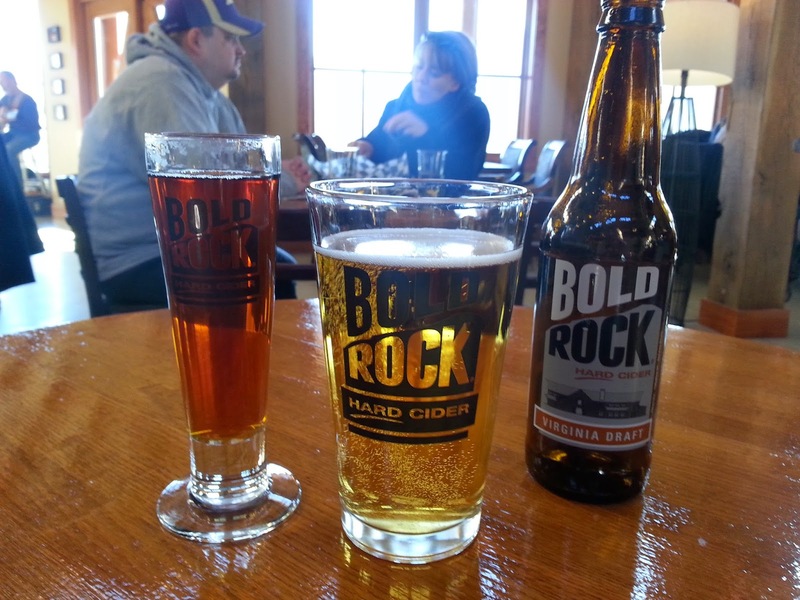 Have you visited Bold Rock or tried their ciders? Linking up with Virginia Bloggers for Friday Favorites! 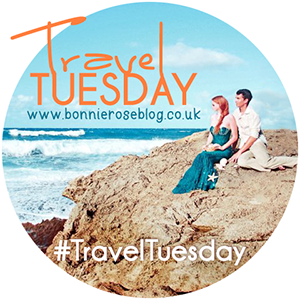 Linking up with Mariah at Food, Booze & Baggage! I had not seen/tried their ciders before we moved :( Have you visited the Blue Bee in Richmond? I liked their ciders. I like cider for a change up, it usually seems less filling to me than beer sometimes. Looks like a very nice side trip! I haven't yet! In fact I had forgotten that it was there until about a week ago, so I'm trying to figure out when I can plan a visit. There are a lot of breweries in Richmond that I haven't tried yet. This makes me want to go to my very own local cidery! I love cider when I want something that's not going to fill me up. Thanks for joining in on the fun! You were down in our area - we have lived in Nelson County for almost 6 years now. There is so much to enjoy about this area. The restaurants along the 151 corridor are excellent as well. Thanks! :) It's about 4.5 hours from Charlotte to either Richmond or Charlottesville, so that's not bad at all! There's plenty to do in Charlotte from what I hear (never been yet), but I personally can attest for all the stuff to do in Virginia, especially if you like nature! I love Nelson county! We would consider moving there, but my husband wants us to stay within commuting distance of Richmond, though we both currently work in Charlottesville. But I love the landscape of Nelson and how it's still rural in spite of all the wonderful small businesses coming to the county! Added to my must-visit list! 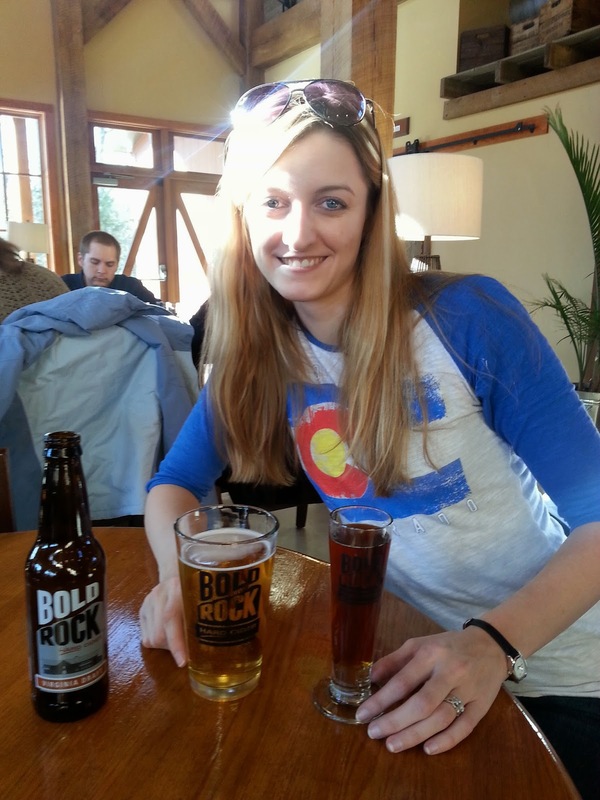 I love Devil's Backbone in that same area but have never been to Bold Rock (though I drink it at home sometimes!). Thanks for sharing. Their cider is quite delicious! I haven't had the chance to visit there, but I love going to breweries so this will have to be added to my list of places to go to! It is well worth the trip! Their location is so beautiful even in the winter. It would make for a great picnic spot or a proposal site! Oooo, and I haven't made it to Devil's Backbone yet! We went to their outpost location in Lexington this weekend, but they only carry 8 of their beers there.